Steven C. Lowe says he has always thought that a 40-foot-tall concrete cross that stands on a large, grassy highway median near his Maryland home was odd. For years, he says, he didn't know that the cross is a war memorial. A plaque on the cross' base lists the names of 49 area residents who died in World War I, but it isn't easily read from the road and getting to the monument requires dashing across traffic. Lowe said he felt the cross implied that the city favored Christians over others. "It certainly made me raise my eyebrows," said Lowe, 68, who is retired from the telecommunications industry. In 2014, Lowe, two other area residents and the District of Columbia-based American Humanist Association, a group that includes atheists and agnostics, sued to challenge the cross. They argue that the cross' location on public land violates the First Amendment's establishment clause, which prohibits the government from favoring one religion over others. The group lost the first round in court, but in 2017 an appeals court ruled the cross unconstitutional. Now, the cross' supporters are asking the Supreme Court to overturn that ruling in a case the justices will hear Wednesday. The memorial's supporters would seem to have a good shot based on the court's decision to take the case and the court's more conservative makeup, seen as more likely to uphold such displays. Plus, even liberal Justice Stephen Breyer voted in a 2005 case to uphold a Ten Commandments display on public property. Backers of the nearly 100-year-old cross, also called the "Peace Cross," say if the justices rule against them it could threaten hundreds of monuments nationwide. Opponents, for their part, say few memorials are truly similar. They argue the cross should be moved to private property or modified into a nonreligious monument such as a slab or obelisk, a suggestion backers say would be desecration. Maryland officials argue that the cross doesn't violate the Constitution because it has a secular purpose and meaning, honoring veterans, in an area where several other memorials to veterans stand. On the other side, the American Humanist Association says that using a cross as a war memorial doesn't make the cross secular; it makes the war memorial Christian. The American Legion, represented by lawyers with the Texas-based First Liberty Institute, says that a test the court announced in 1971 for use in such cases, which asks whether the government's action has a secular purpose, advances or inhibits religion or fosters "an excessive government entanglement with religion," has proved unworkable. They say that question the justices should be asking is whether the government's action is coercive, which they say the cross is not. The court doesn't have to rule that broadly, however, to side with the monument's supporters. 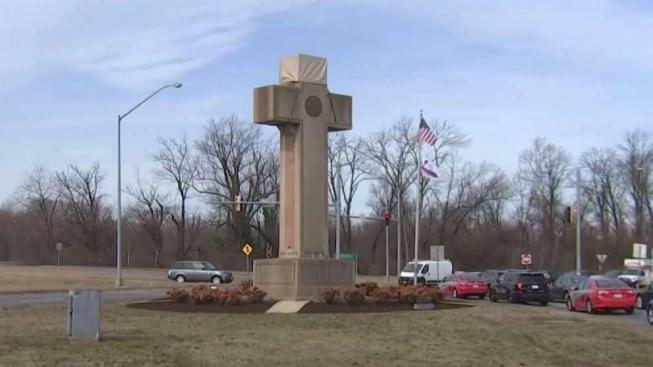 The monument's backers say they just want the cross left alone. Speaking recently at an American Legion post near the cross, member Stan Shaw said modifying the cross would be "a slap in a veteran's face." As for the suggestion the monument should be moved, Mike Moore, another member, said he's "not sure how one could do it." Add that to the fact that the monument is cracking and repair work has been on hold. Relatives of the men whose names are on the cross have also asked the court to let it stand where it is. Mary Ann LaQuay, whose uncle Thomas Fenwick's name is on the cross, says it's a way for her to remember her uncle, who caught pneumonia and died while fighting in France. His grave is in Arlington National Cemetery in Virginia, but LaQuay, 80, says she feels "like the cross represents his memorial." Those challenging the cross say they want to make clear that they aren't against veterans or veterans memorials. Fred Edwords, a longtime official with the American Humanist Association, says they just don't think it's right to leave the impression that only Christian soldiers are being celebrated. Lowe, the Maryland resident who lives near the cross, said some people have asked him: Why not just leave the cross alone? "I think it was a violation of the Constitution when it was built," he said. "The fact that it is old doesn't make it right. It's an old wrong."